CMA Announces Four Stage Lineups! 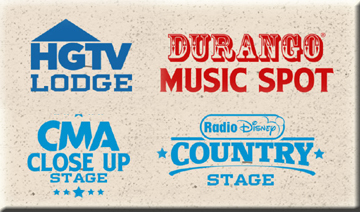 HGTV Lodge, CMA Close Up Stage, the Durango Music Spot, and Radio Disney have Been Released! The CMA released the lineups for the HGTV Lodge, CMA Close Up Stage, Durango Music Spot, and Radio Disney Stage today! Check out the lineups below! The HGTV Lodge is just as fantastic as ever! If are lucky to win these performance through the Ulitimate Fan Experience Drawing as they feature superstars and other well-establisehed country music artists in an intimate venue! This year's spectacular lineup will feature Keith Urban, Maren Morris, Darius Rucker, Chris Janson, and many more! We are excited for Artists of the Day Martina McBride (Thursday) and Brad Paisley (Saturday)! Friday and Sunday's Artist of the day are to be announced soon! We are a little disappointing with this years' Durango Music Spot lineup but will be happy to catch performances by Wade Hayes, Mickey Gilley, and Jeannie Seely. We are impressed with the talent coming to the Radio Disney Country Stage this year! It's going to be a jam packed venue with appearances by Hunter Hayes, High Valley, and Luke Combs! We aslo hope to see LANCO, LOCASH, Carly Pearce, and Kalie Shorr!